A groundbreaking agreement between Unite the Union and Manchester City Council requires all voluntary sector organisations operating with the support of the local authority to follow ethical employment standards. The agreement, the first of its kind in the UK, covers all members of staff, contractors and volunteers of voluntary, community and not-for-profit organisations who are commissioned, contracted or receiving grants from Manchester City Council. There are approximately 42,000 voluntary sector workers in greater Manchester working for 16,000 charities and voluntary organisations with a combined income of £1.3 billion. While the majority treat staff well, some have little concern for the rights and well-being of their workforce. Other organisations which are struggling to survive place staff under great pressure in insecure employment. By being required to follow ethical employment practices all voluntary groups will have to ensure that their staff are at least paid the Manchester living wage (£8.75 an hour), workers have an employment contract and end excessive hours. Unite expects that following further negotiations the council will add sleep-in shifts and travel time between appointments to the policy. If employers do not respect the minimum standards outlined in the council’s ethical procurement policy, there are agreed procedures for the union to raise the alarm with the council. Evidence presented by the Unite branch of non-compliance with the standards will be fast tracked for investigation. Cllr Carl Ollerhead, executive member for finance and human resources, said: “I am delighted that Manchester city council is leading the way in ensuring that voluntary and charity staff will have their pay and conditions protected. Cllr Sue Murphy, deputy leader of Manchester council, said: “It is an honour to sign this historic agreement which will help to ensure that all voluntary organisations in Manchester treat their staff fairly and decently. Unite Manchester community and not for profit branch secretary Alison Treacher said: “This is a real step forward. There are thousands of charity staff in Manchester who are on the frontline of social care, mental health, housing and other key service. Yet many of us are on poverty wages, precarious contracts and work in appalling conditions. “This agreement can help stop these abuses. Previously, unless Unite was recognised in the workplace, charity staff could only raise complaints through their own management, potentially placing their employment at risk. “Now they can do it confidentially through Unite and be assured that they will be taken seriously by Manchester city council, as the commissioning or grant awarding body. Unite national officer for the not for profit sector Siobhan Endean said: “This is a groundbreaking agreement which for the first time creates measures for the effective policing of voluntary organisations funded by councils, on employment issues. “For too long pay, conditions and other employment rights have been a grey area when it comes to the voluntary sector and this agreement is the first step in bringing proper regulation to the sector. 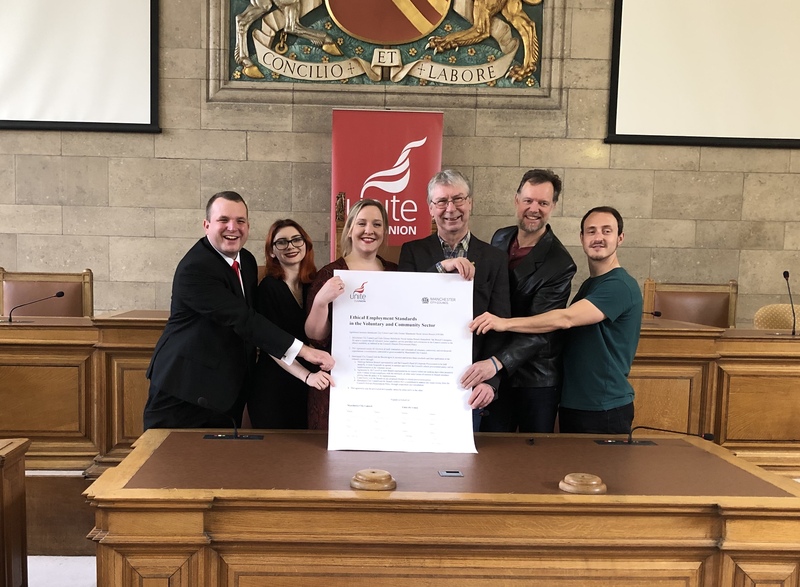 Unite is now in the process of lobbying other councils in the greater Manchester area to also adopt the charter, to further protect voluntary sector workers in the region. The charter will then be rolled out across the UK later this year.